The EM-138-3 is a three channel 30-led bar display. All channels have two selectable measuring ranges 4...20mA and 0...10V. Signal input is overvoltage and overcurrent protected. 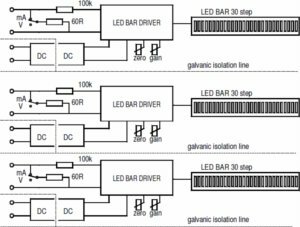 Three channels are electrically separate devices, and the signals are galvanically isolated from supply. All channels have adjustments for trimming gain and zero. The range selectors and the trimmers are located at the rear panel. Display colour is red-orange. The backround colour is black and the markings are with white. Adjustments zero ± 10% min.